It's the huge 2 years celebration for Weekend Herb Blogging and Kalyn has asked that we do something a little different - we're to post a recipe that has at least one vegetable and herb and to also vote for our favourite herb and vegetable. For its sheer versatility, you're able to boil, steam, bake, braise, bbq, stew, mash, roast and sauté, turn it into pasta and even make the most scrumptious potato and chocolate cake. The range of species makes sure there's a potato to suit every need and it even comes in colours! 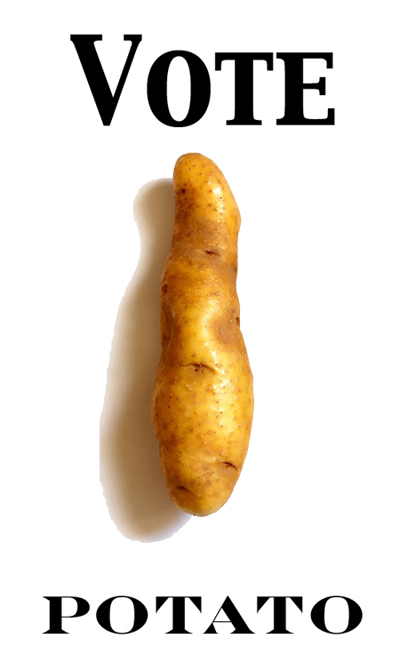 So yes, my vote for favourite vegetable must go to that ever humble spud. Naturally the recipe I'll be making uses potatoes and since I don't have an oven I had to make something I could do on the stove top. 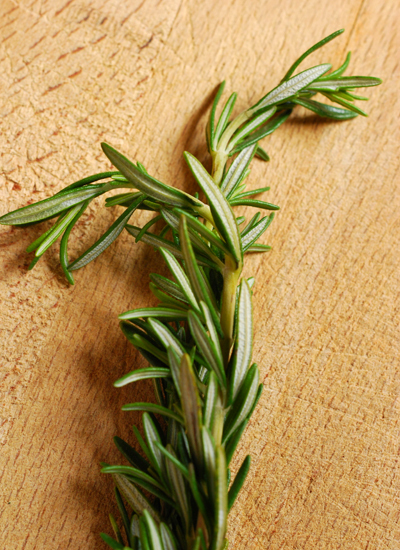 One of the herbs that just loves potato is rosemary. With these two ingredients and some garlic cloves I'm able to make pan roasted potatoes, just like my mother makes and probably how she made them here in Italy. 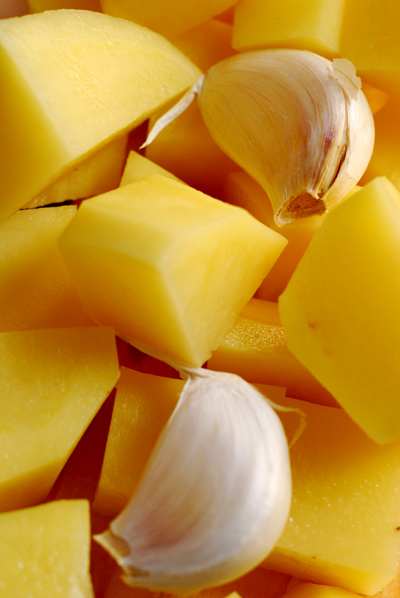 peel them and then cut them into even sized chunks. Combine with the unpeeled garlic cloves, a grinding of salt and black pepper and drizzle over a little olive oil to coat and toss well. Heat up a skillet and add a little more oil in the pan along with the sprigs of rosemary and under a gentle heat bring it up to temperature - the rosemary should start to sizzle. Add the potatoes, tossing them through the oil and rosemary and allow them the colour on one side before tossing it again. If they are browning too quickly, then turn down the heat and deglaze the pan with a little white wine - place a lid on the skillet and let them steam. The time taken will depend on how large you've cut them - these took around 20 minutes to make. The end product should be soft on the inside with a nice crispy crust on the outside. You'll also find that the garlic cloves will have softened nicely during this time and can squeezed out of their skins - this is especially good if serving the potatoes with a meat dish. Very good campaigning. You might want to go into politics! 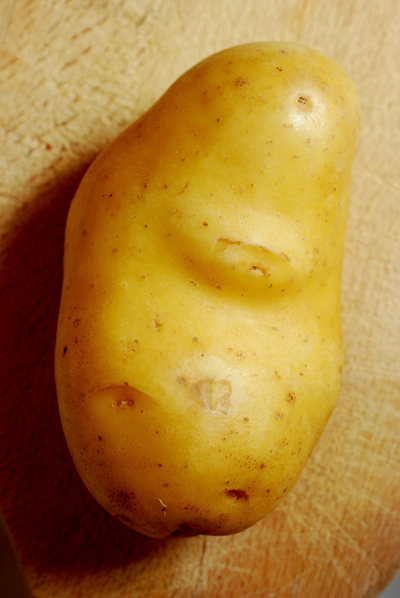 I knew you would come up with a great entry, and the collection of your potato photos is gorgeous. I do agree, the potato loves rosemary, what a wonderful match! Thanks for helping make the two year anniversary so much fun! At least 6 out of 7 days we had boiled potatoes with dinner when I was growing up. Once I was on my own I avoided them. Then I slowly worked them back in: roasted, fried, baked, sauteed, ...now I've come full circle and love plain boiled potatoes - along with the rest, of course. 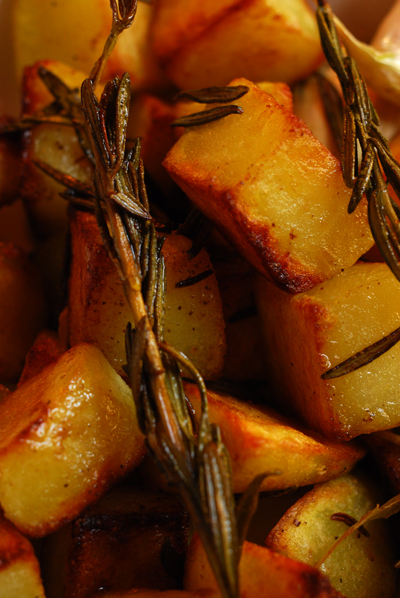 And I do sprinkle, even the plain boiled ones, with herbs, rosemary, sage..
Who wouldn't love those potatoes? Who?!?! I made some patatas bravas the other day as part of my Spanish cooking resolution. 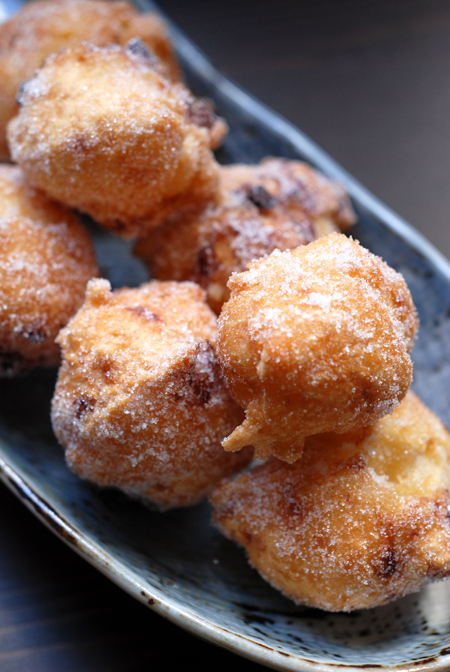 I've also made the famous Catalan snack pa amb tomaquet a few times, always irresistible. We make ourselves sandwiches at the end of each day at work and it's amazing to see how much effort and enthusiasm they put into such a simple snack. Thanks Kalyn, I think I should have started campaigning earlier to have any chance of getting potatoes through. Oh well, next time Katie! I know I love them Kevin. Yum, I always must have patatas bravas if it's on the menu, it's such a great dish, simple but so delicious. It must be great to be in that type of environment Trig with a real passion for food. I loved your post. In Australia, we had only a couple of potato varieties until relatively recently. And in Adelaide, it is still difficult to find a wide range - the Farmers Market and some organic vege shops are the only source. I really love playing with different varieties (and colours!). Your post also uses one of my favourite herbs - Rosemary. I used it on the weekend with some baked cannellini beans and it was very special. 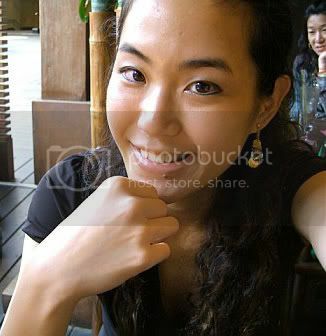 Your photos are always great. I can smell those potatoes from here. Wow~~this makes a perfect side dish! I've made potatoes with rosemary and garlic but I never thought to keep the garlic skins on. Thanks ,the roasted garlic is a wonderful idea! Those roasted potatoes look so good. I like the idea of leaving the skin on the garlic while cooking. I certainly back you on potatoes being versatile! I made a similar dish with potatoes and thyme and loved it. Have to try it with rosemary now. Thanks for putting me on track of that! What a fun post Haalo. And once again, the photos are gorgeous. 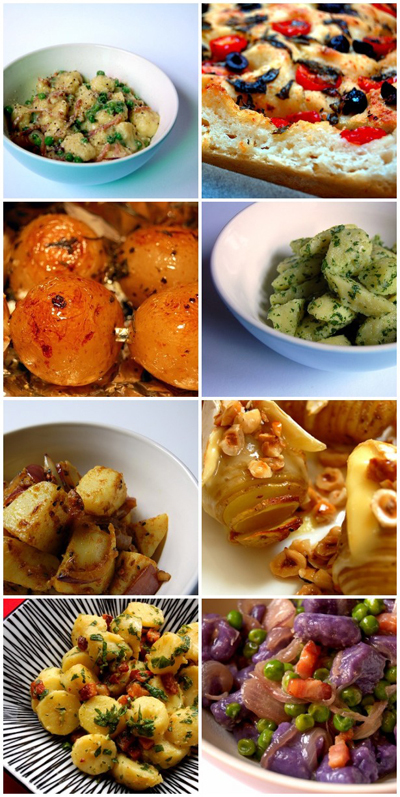 I love the idea of roasting potatoes with whole cloves of garlic . . . mmm. 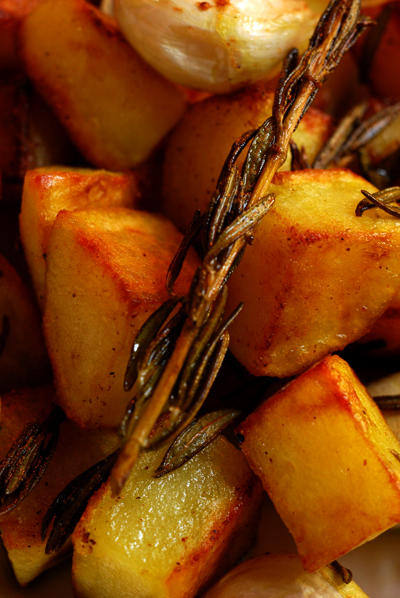 I LOVE potatoes and rosemary. The perfect comfort food!! Thanks Vege - there's more potato varieties in Australia than what I have seen so far here in Italy. At times I think we don't realise or perhaps take for granted how much we have in Australia and how easily accessible it is. 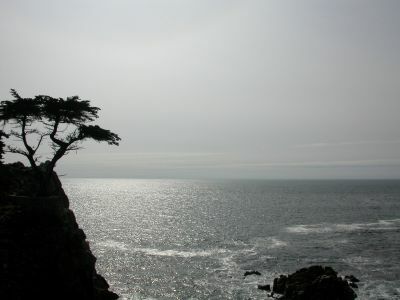 Hi haalo- I found your site indirectly from Bloger.org. This recipe looks wonderful. I have tons of fresh rosemary growing in my garden and am always looking for new ways to use it. Question: when you squeeze the garlic out of its skin, how do you serve the paste? Do you mix it in with the potatoes, or do you serve it on the side? Thanks! Hi Gail - you can do either, if you are serving the potatoes with say steak, the garlic is really good served as a condiment with the meat.